I was lucky enough to be off of work this past Friday afternoon. 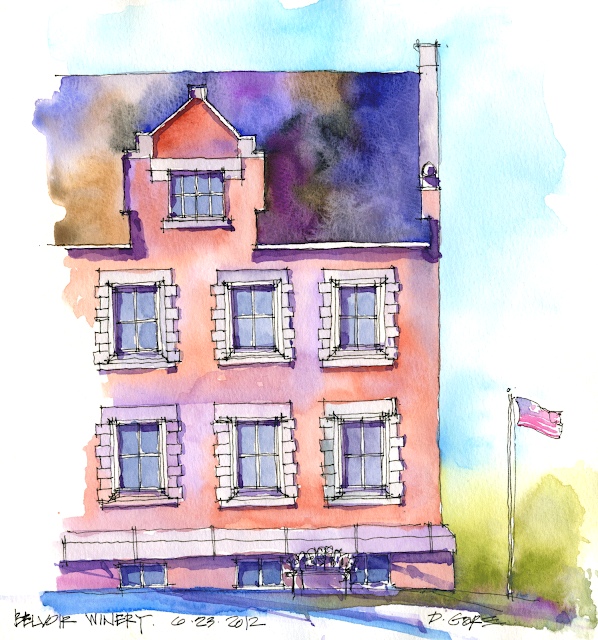 We went for a drive and made our way to Lexington, MO where I was fortunate to find a bench in a nice shady spot across the street from this courthouse. I don't know when this was built but in the upper left column there is a cannonball from the Civil War Battle of Lexington in September of 1861. The first time I ever saw this building I was very young and saw it with my Grandparents. From Lexington we made our way on down to Higginsville, MO. There is a state park that used to be a home for Confederate Veterans. This church is in the park adjacent to a cemetery. I was again able to find a bench under a large tree that provided much needed shade on a hot afternoon. Across the street from the church is a small cottage that I believe was originally used by the caretaker for the property. Not sure if anyone resides here today but it is a wonderful little structure. 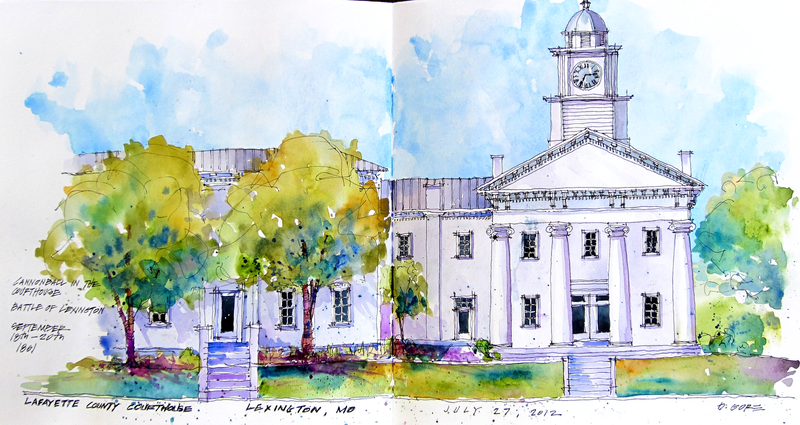 sketching at Friday's doctor's appt., a photo by vickylw on Flickr. Nothing conclusive was found when I saw an ear doctor about the vertigo on Friday . 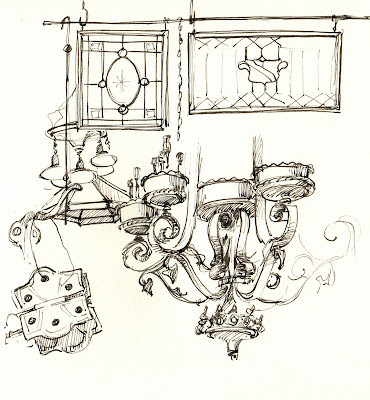 . . but I had several sketching opportunities while waiting in the various rooms. Today, I did some more medical office sketching -- this time while my mom saw her eye doctor. At first I decided to not try sketching her doctor, knowing how he is constantly moving. Then he took a phone call so I did a quick gesture sketch. He must have eyes in the back of his head because as soon as he hung up and stood up, he turned around and asked to see my sketch. It's hard to believe that this beach is less than a block away from Chicago's well-shopped Mag Mile! Our Monday sketch group numbered only two who were willing to brave the sun and heat. 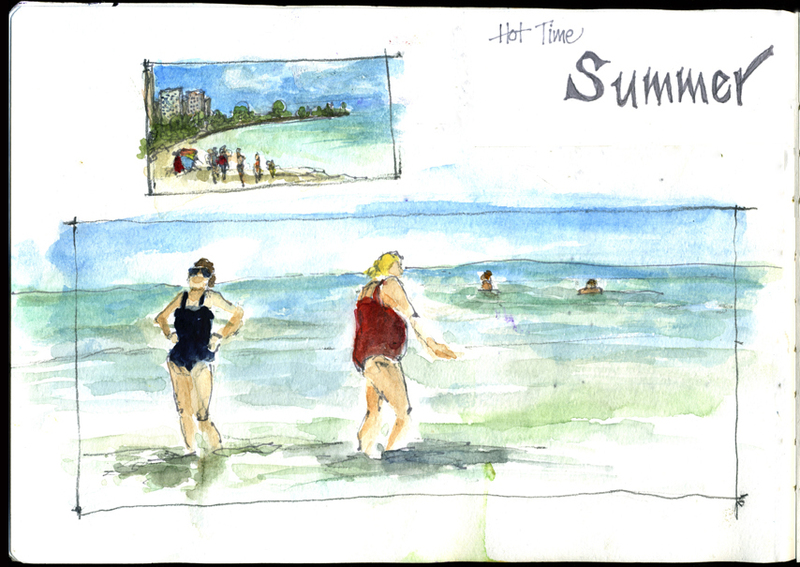 We sat at a table under an umbrella, sipped cold drinks and sketched for two hours. Hard work but someone has to do it! This is what the ConAgra grain elevator looked like yesterday. 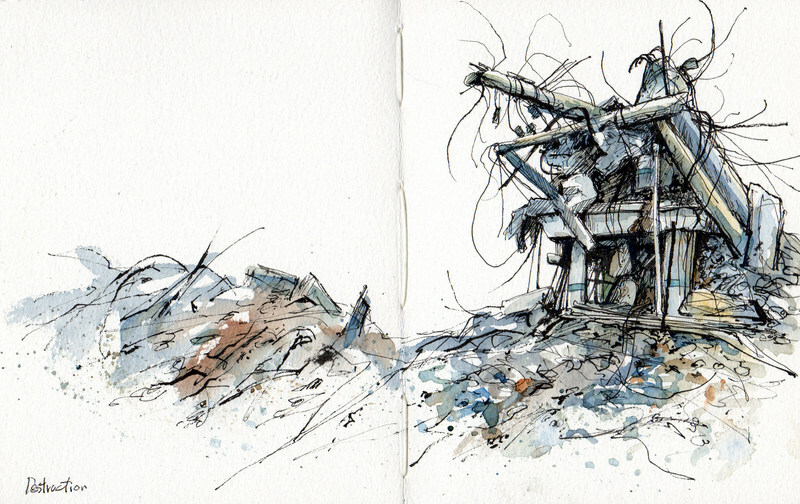 I had a ball sketching the complex shapes and those wild-hair-like rebar sticking out everywhere. I used my Hero pen, a Noodler's flex, and watercolor. And this is what it looked like when I sketched it in March--it's been slow, but they've made progress! I missed this past Saturday's sketch outing at the Bass Pro Shop because I went to Joplin, MO with my Son. He is a police officer and was one of the earliest responders sent to Joplin in the days following the devastating tornado in May of 2011. He spent nearly two weeks there helping to deal with the aftermath of what had happened to a widespread area of the city. Just north of the hospital they have built a small park dedicated to the volunteers that came to help. It is a beautiful park / memorial and it was nice to see something new within the affected area. I sat on a small stone wall and sketched this scene of this lone house with the outer walls standing but the roof and interior severely damaged. The tree was stripped of all foliage with the exception of the one single branch that was full of leaves. It was a very eery scene but I believe typical of what it looked like in the immediate days following the disaster. 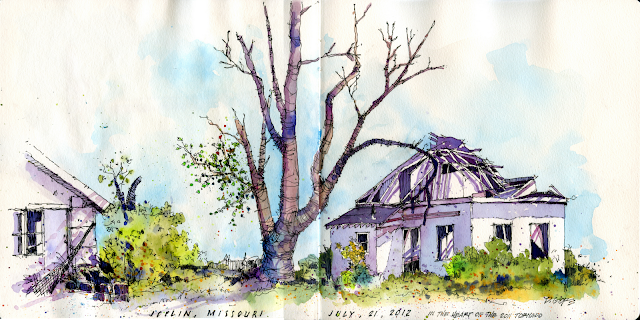 Although it has been 14 months since the tornado, I'm glad I had the opportunity to visit this with Andrew and to record this still haunting scene in my sketchbook. While I was sketching my drawing above, Andrew was drawing this scene of the hospital which was just to the south of where we were. It was damaged beyond repair so it is undergoing complete demolition. 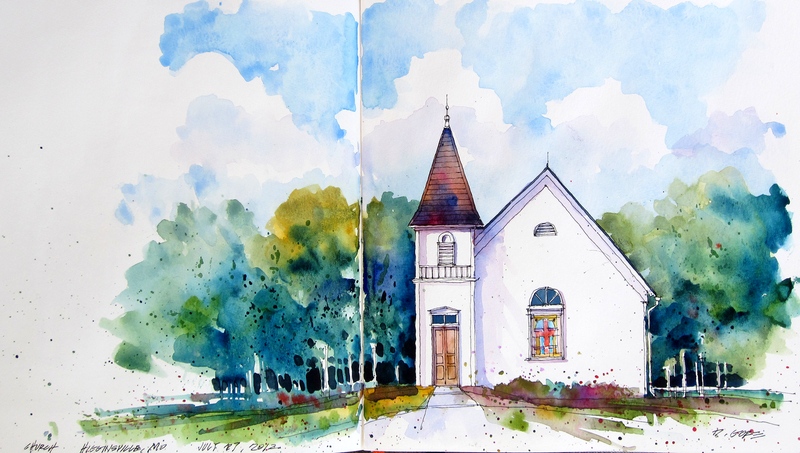 Andrew is new to sketching and has just started to experiment with adding watercolor to his drawings. I think he is doing a fantastic job in just the short time he has been doing this and wanted to share his drawing here as well. 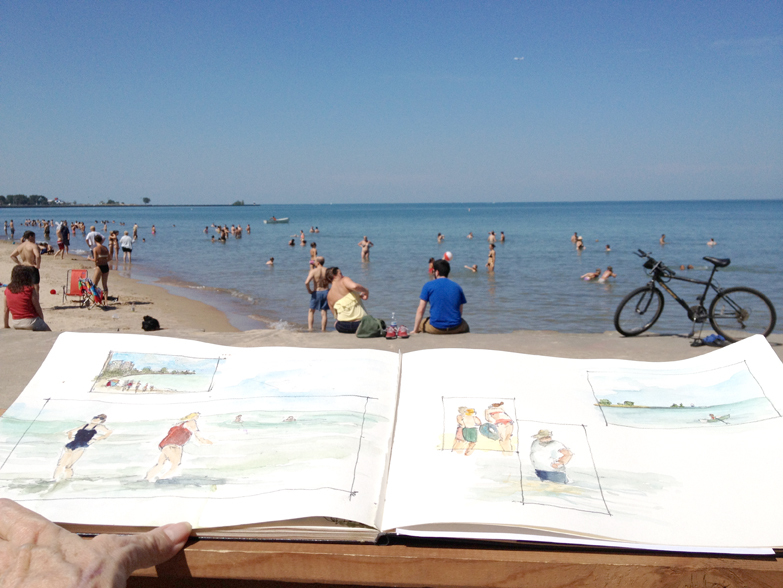 Hopefully we will have a new addition to Urban Sketchers Midwest . . .
Saturday was a great experience and I'm lucky to have spent the day as we did. 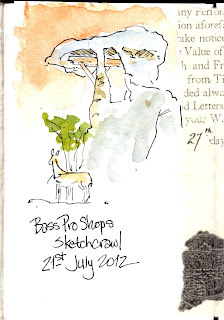 From yesterday's sketchcrawl at Bass Pro Shops, Independence, MO. Given that the outside temp was over 100, it was nice to be "outdoors" while inside in the air conditioning! 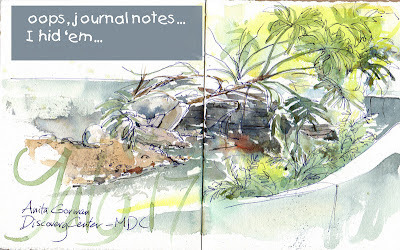 Journal entry in ink & watercolor. Morning sketch. Marina Towers, IBM Building, reflection of Trump Tower in IBM Building and Wabash bridge. Note the sunny skies, crisp shadows and an overall beautiful day. Afternoon sketch. Same Marina Towers, IBM Building, Trump Tower from a different spot as we were hiding from the storm under 55 W. Wacker building. The storm was amazing, a true flood, but we were dry and happy, and kept on sketching in the hideaway that Barbara found for us. This is how it looked. Barbara and I grinning and happy to be sketching all day. 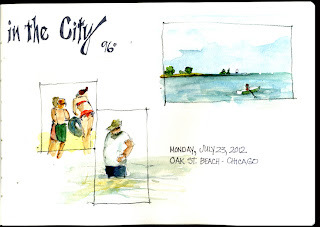 USk Chicago participated as a group this time. 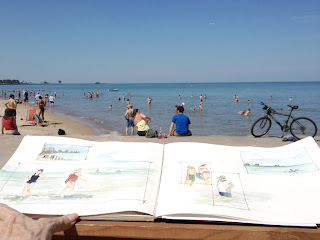 There are more sketches and photos on our Facebook group Urban Sketchers Chicago if people are curious. This was my quick sketch of the wetlands demo at the Anita Gorman Discovery Center, a Missouri Department of Conservation nature center. Interesting how the plants and gravel work to purify the water... the light was great and the table and chairs were handy, so this was a natural! MUCH cooler inside...it was well over 100 that day. 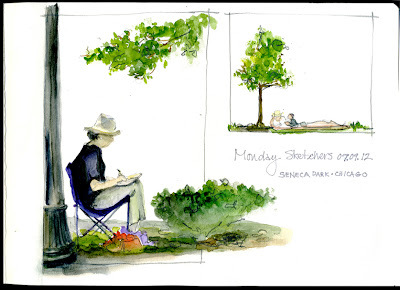 One of my fave places to sketch and paint is the Victorian era park on the city's south side. Landscape workers have maintained the park very well this summer as always so despite the withering drought and record high temps the flowers and lily pads are in full bloom. Elephant ear ferns, cannas, crepe myrtle, castor bean, fountain grass as well as the palmettos and other tropical foliage continue to flourish. Formal pathways wind through the park, around colorful gazebos, elegant plantings, statuary and fountains. 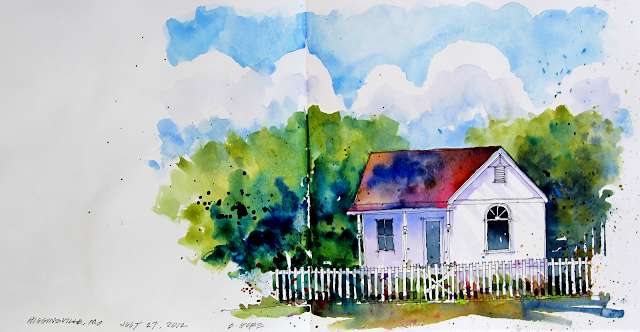 Missouri Plein Air Painters met here on four consecutive Sunday mornings beginning in late June. 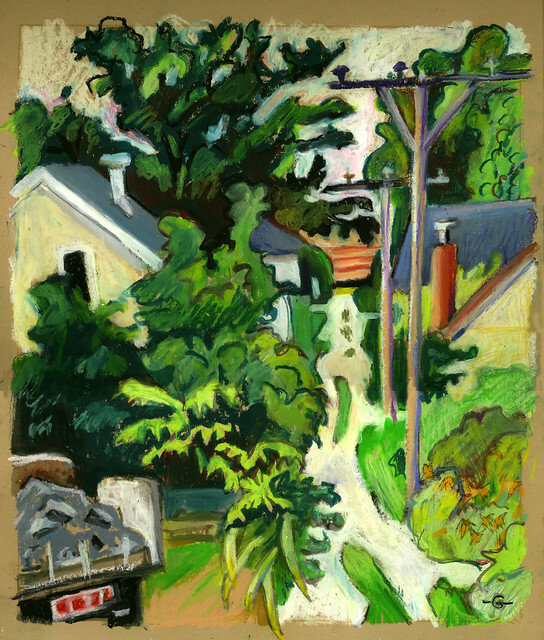 Tower Grove Path, 07/01/2012; Michael Anderson, watercolor on Arches 140lb rough, 8" h x 23" w.
I don't know about you but for me the summer days seem to fly by faster and faster every time they roll around! Here are are a few sketches from recent weeks. Not all winners but the time spent doing them was delightful! 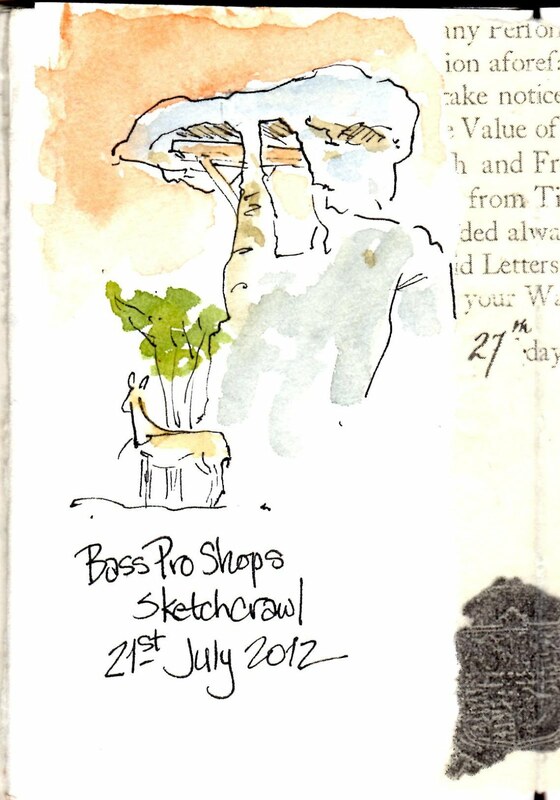 Tomorrow is the 36th World Wide SketchCrawl. 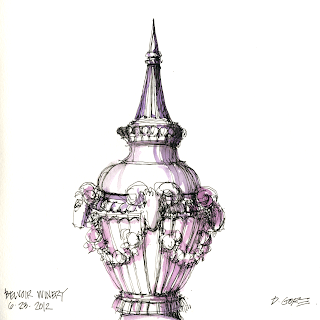 I'm really looking forward to it and, for me, the sheer indulgence of sketching all day! Urban Sketchers Chicago is meeting near the Chicago River on Wabash. If you'd like to join us check the details on USk-Chicago's FB page. 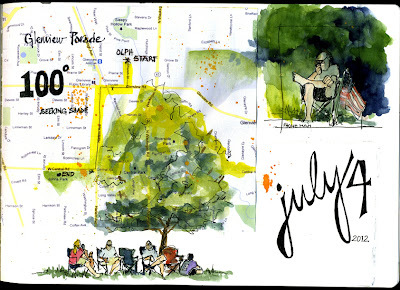 Where ever you are I hope you draw and have a lazy-hazy summer day! James Nutt - First Post! Hello everyone, my name is James Nutt. Cathy was kind enough to invite me to become one of the co-authors after getting involved with the Facebook page. I am an architect living in Minneapolis. I draw a lot. I draw at work, at home, and it is almost all that I did in high school. (So much drawing didn't help my GPA, but that is what I get paid to do now). I love this forum and I love seeing others people's work. Most of my drawings are very small and about 35 minutes a piece. Mostly pen and pencil, but lately a lot of IPad drawing and watercolor. Quite a few of my drawings and past drawings fit the Urban Sketchers rules. This year I gave myself a challenge to draw everyday and post. For the most part it happens and I have really enjoyed sharing and hearing the comments. I look forward to contributing on this blog seeing so much amazing work. This sketch is from today at the Minneapolis downtown Barnes and Noble. I had the rare condition of having a couple of hours to kill between an eye appointment and the zoning board I sit on. I did several attempts at drawing today’s farmer’s market with no success. I decided I had broken my own cardinal rule of trying to start the day with too complex of a drawing. So I zoomed in one of the Macy’s building windows I have always loved and got a sketch I was happy with. This drawing is approximately 5x7. 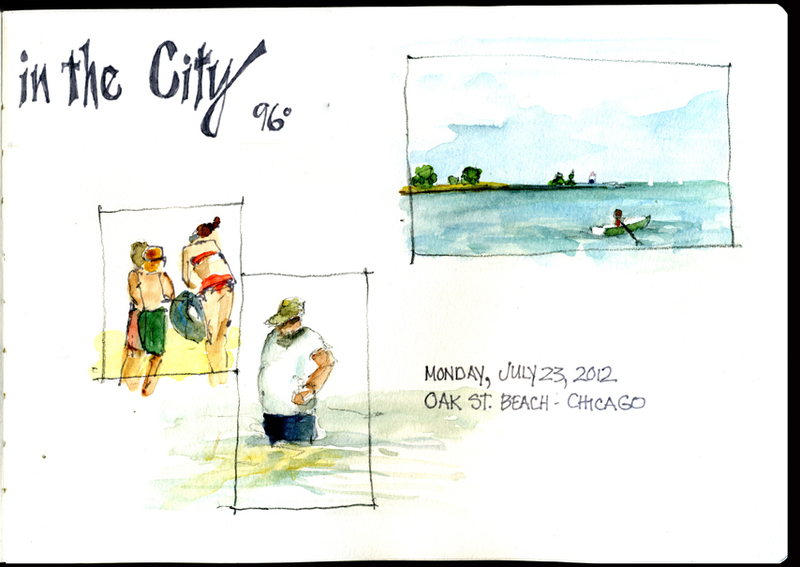 I've been meaning to post this sketch since the last USk Chicago meet on June 17. 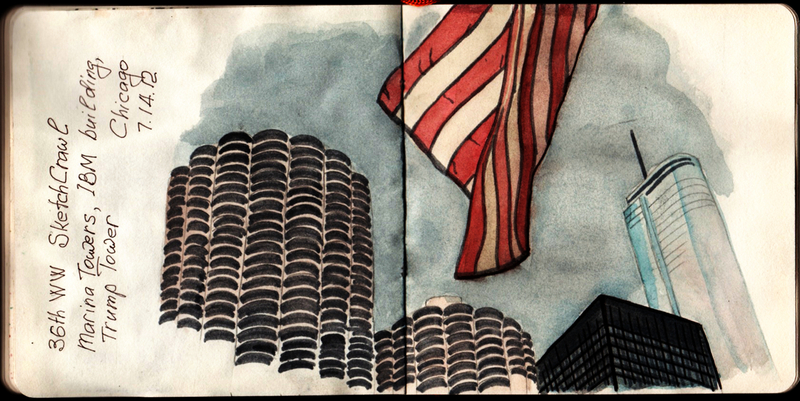 We had a lot of fun in the busy Chicago Chinatown and came out with some great sketches. Here's mine with Three Happiness restaurant, some shops and a Chinatown Fire Station which happened to be incredibly busy - its two engines blasting out of the fire house with sirens screaming full volume several times while we were sketching. It was an eventful and loud session! 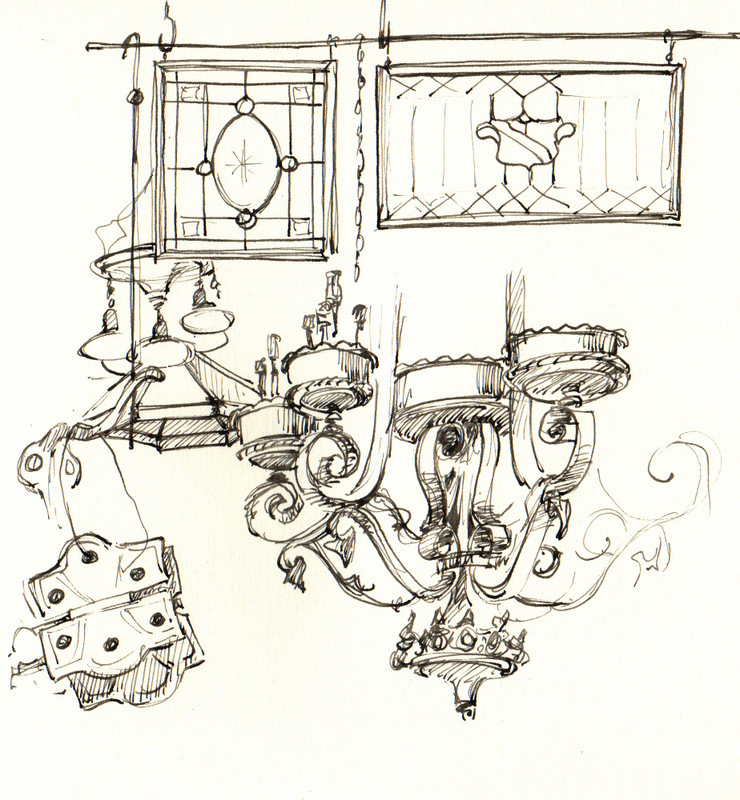 This is one of the many sketches I've done at Architectural Salvage, in Kansas City--what a treasure trove! 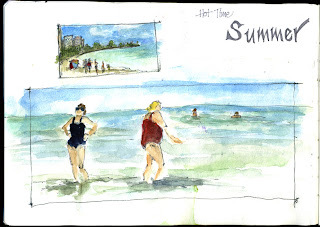 The show is The Art of Urban Sketching, and a bunch of us correspondents for our parent blog, Urban Sketchers, donated work to benefit the organization and the museum. 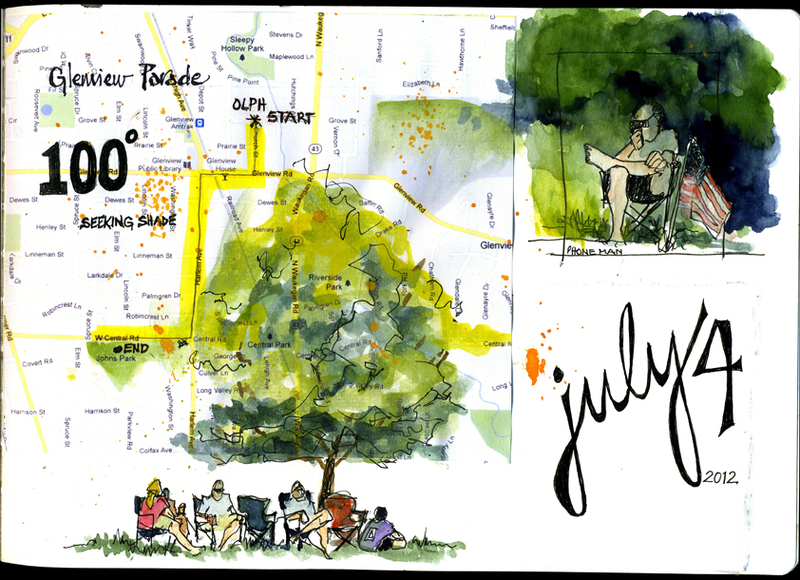 Sales will help fund symposia, workshops, and other projects that encourage the art of urban sketching! Hope you can make it there--the show opens August 10 and promises to be an exciting peek into urban sketches across the globe. Back alleys bisect many blocks in my Cedar Fall, Iowa, old-town neighborhood. They're unpaved and un-curbed. I love walking down them and peeking into people's backyards. Even if homeowners keep the fronts of their property neat and tidy, the backs--as seen from the alleyways--are often scrappier. I find this interesting. One of these days, the garage on the left is going to fall over or be taken down. Meanwhile, I wanted to capture its twisting form. I drew this this evening after the temperature dropped below 100 degrees. It's a couple blocks from my house. I tested out my new stool for the first time, the one I'll be taking to the Urban Sketching Symposium next week. 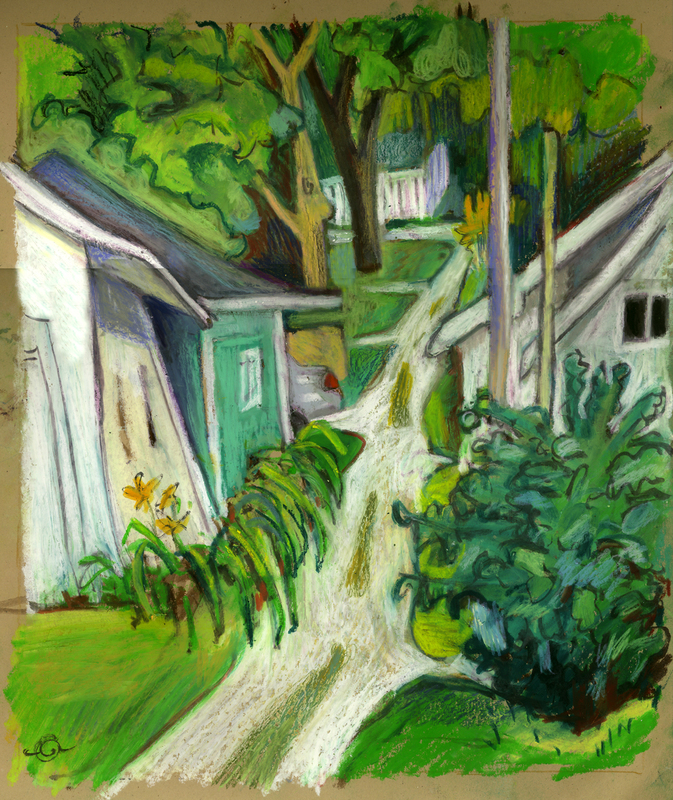 I drew this next one the day before, looking from my backyard down the alleyway to the bi-colored brick Lincoln Elementary School, several blocks away. I was attracted to this scene initially by the curvy shape of the alley and the odd shaped patches of weeds that grow down the center. Again, the heat was beastly; I waited until evening when the temperature dropped to the tolerable 95 degrees in the shade. If you saw me in the photo that Kate posted previously, this is what I was sketching at the time. I had time to get the ink down on paper before the rain & lightning forced us inside. I added the watercolor sitting at a big round table inside the winery. Trying to have more fun with my color choices . . .
After the rains subsided, the sun came out and it actually got quite sunny and warm. 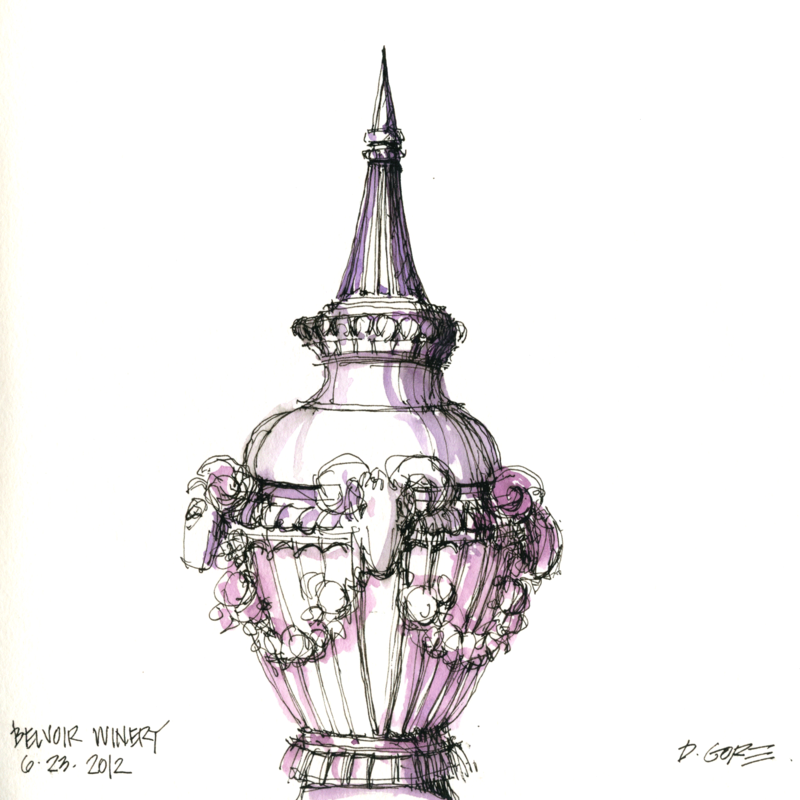 I had a few minutes to sit on the front steps and sketch this portion of a statue / ornament along the driveway that runs in front of the main building. 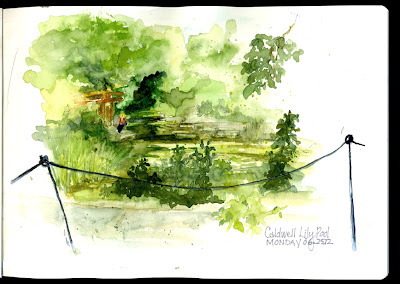 I did some urban sketching this morning in beautiful Forest Park in St. Louis with the St. Louis Drawing & Painting Meetup group.